The Oliver II is a very practical and compact sauna cabin and fits almost any garden. It has a small room for changing, socializing and relaxing, separate shower room as well as a 2x2m sauna room for 3-4 adult bathers. 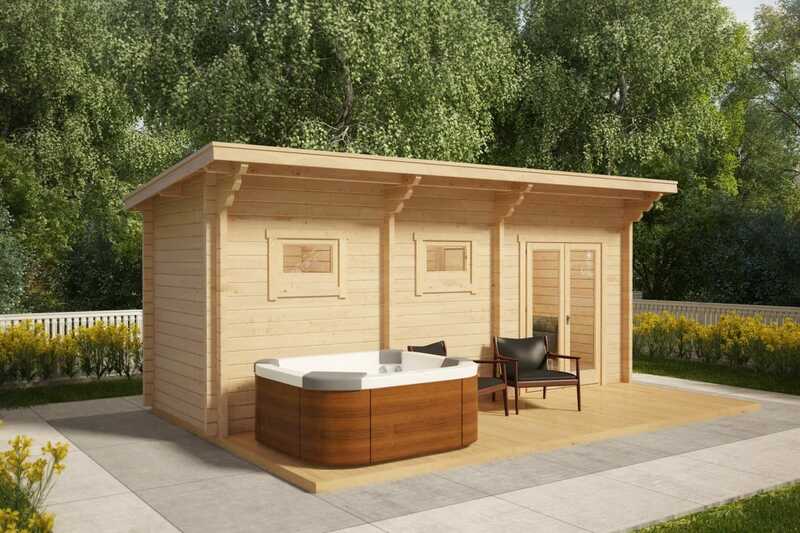 All these above mentioned features make up a perfect family sized sauna cabin with all the necessary sauna functions. A Large 2x6m terrace decking has ample space for a hot tub and there will still be plenty of room left for an outdoor seating area. 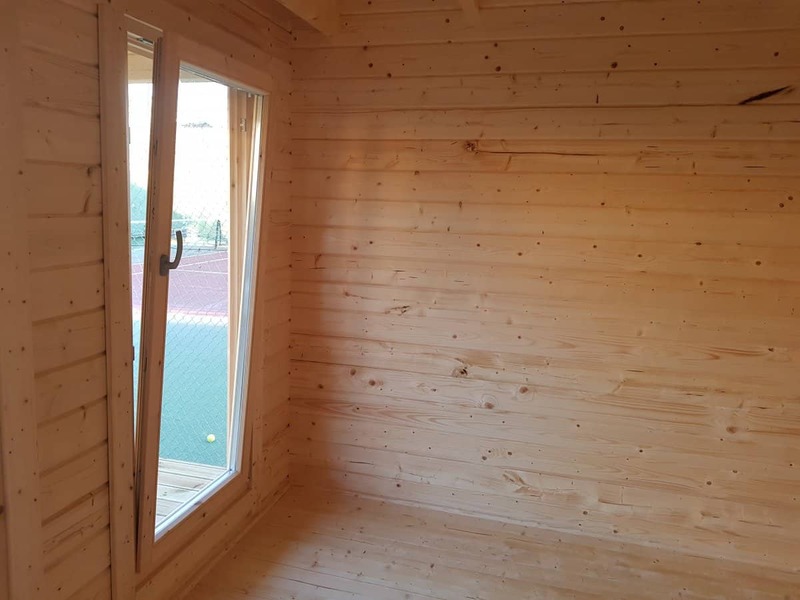 Its thick 70mm walls as well as double glazed windows ensure a reduced heating time and keep your sauna hot and power efficient. Door style Part glazed, double door; wooden interior door, special sauna door made of 8 mm toughened glass (safety glass), with a light bronze tint. Material: Finnish garden sauna made of slow grown Nordic spruce, untreated. 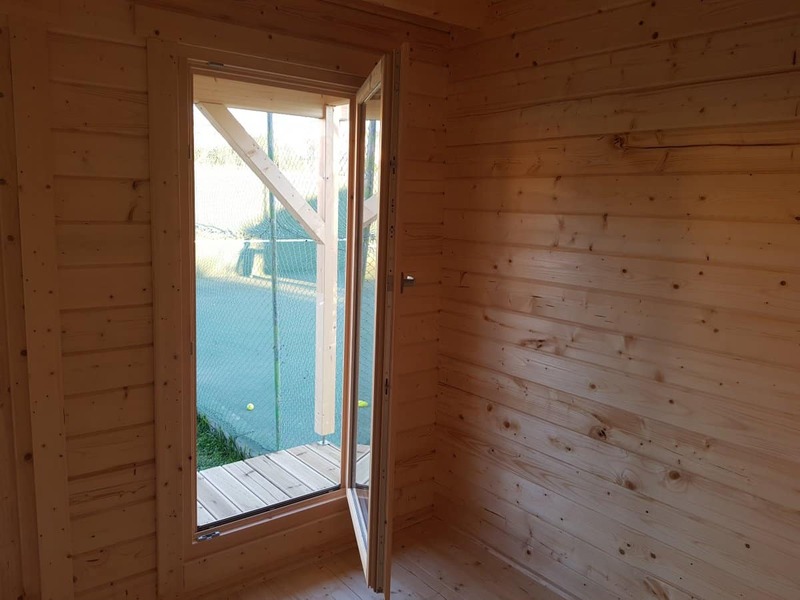 Additional information: Treated foundation joists, wind braces, assembly kit, real glass in windows and doors, cylinder lock, product manual, 5 years guarantee. Cat: sauna cabins and garden SPA. 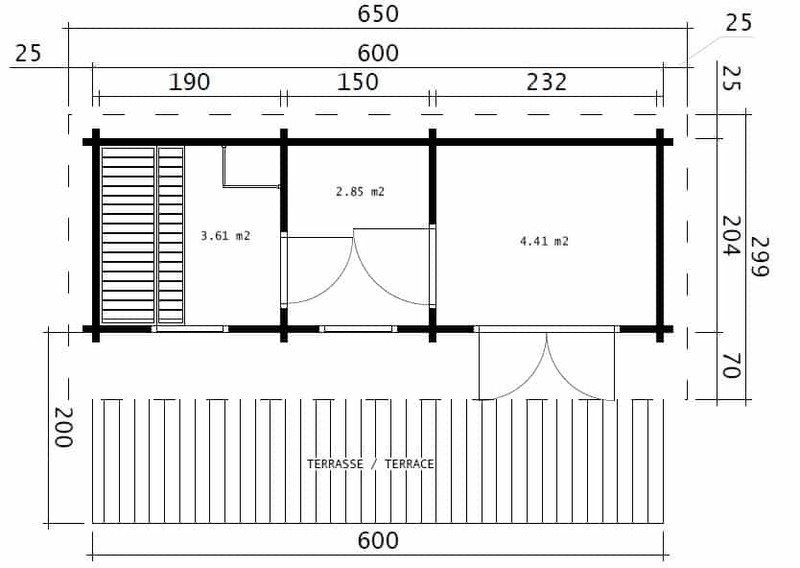 Internal Sauna Room: 1,9 x 1,9 m (6′ 2” x 6′ 2”). 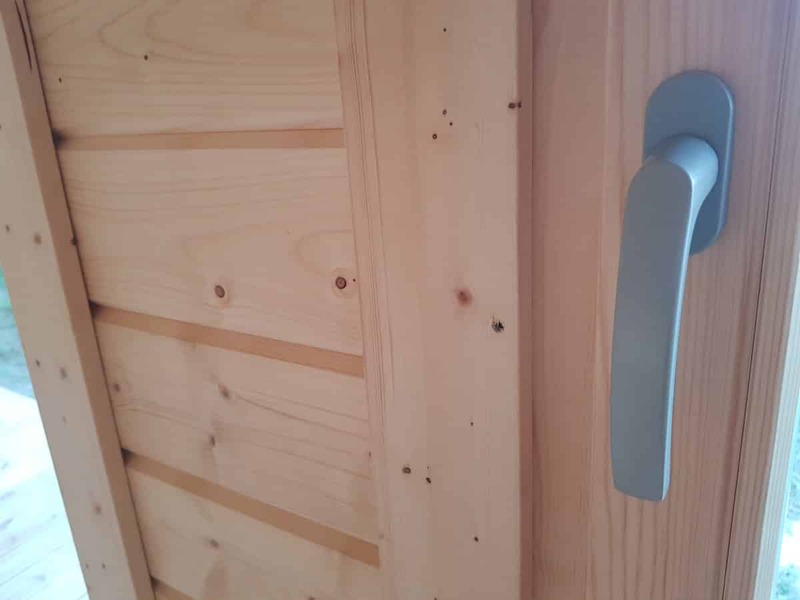 All our Standard Sauna Cabins come with insulated sauna ceiling (absolute must), benches and stove guard made of finest selected Spruce, sauna benches, headrests, wooden floor grate and special sauna door made of 8mm toughened glass (safety glass), with a light bronze tint- just add one of our recommended Harvia sauna heaters to have Fully Complete Sauna Package for 3-4 bathers. This policy contains details of the delivery methods, periods and charges that apply to orders for our products made through our website, by telephone and email. 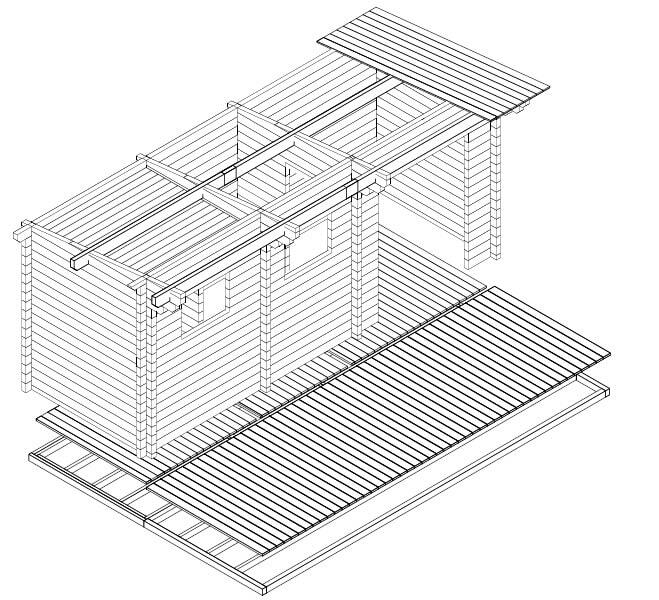 We aim to deliver our log cabins within the stated lead time estimation, as detailed at time of placing your order. 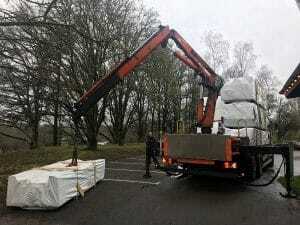 Delivery time for Kirami wood fired hot tubs is generally between fifteen and twenty working days. The most accurate delivery times are shown on each product page. Please be aware that lead times vary depending on factory schedule throughout the year. As a rule, we deliver your log cabin or wood fired hot tub on a six-wheeled delivery truck. Our delivery team use Hi-Ab vehicles with an unloading crane for easy and safe unloading. 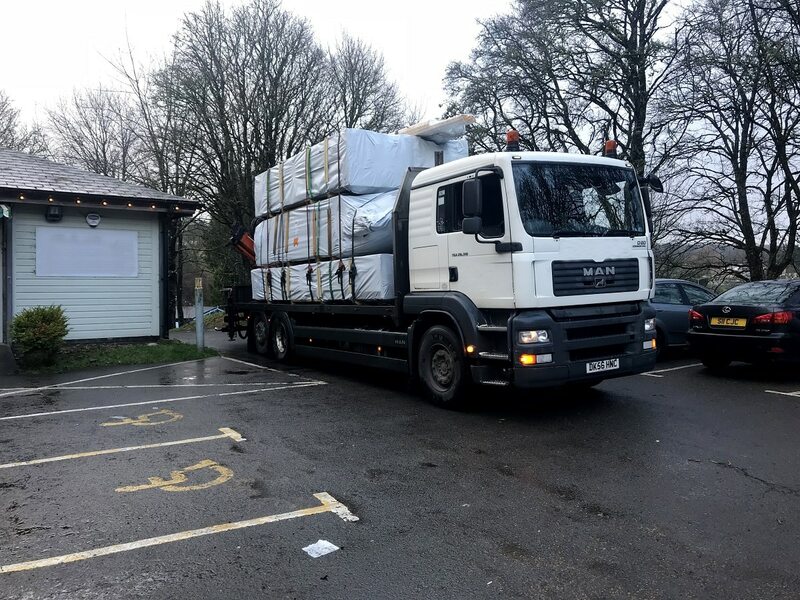 Delivery is kerbside, although we will always try and deliver your log cabin or other products as close to your desired location as possible. Due to the weight of the vehicles and extending safety support arms, our delivery vehicles can only operate on hard standing and are not able to drive in to your garden, over soft ground or fields. In order for this to occur we need sufficient space and access for the lorry and unloading crane to manoeuvre. If you have questions regarding access required, please contact us on 020 3807 0369. It is important that we know there is enough space for safe unloading. If this is not the case and we don’t have advanced warning, we may have to charge you a delivery fee. Please be specific about the most convenient spot for us to offload your log cabin. We make every effort to comply. Be aware, due to the nature of the size and weight of the packages, we may not always be able to place your cabin exactly where you want it. 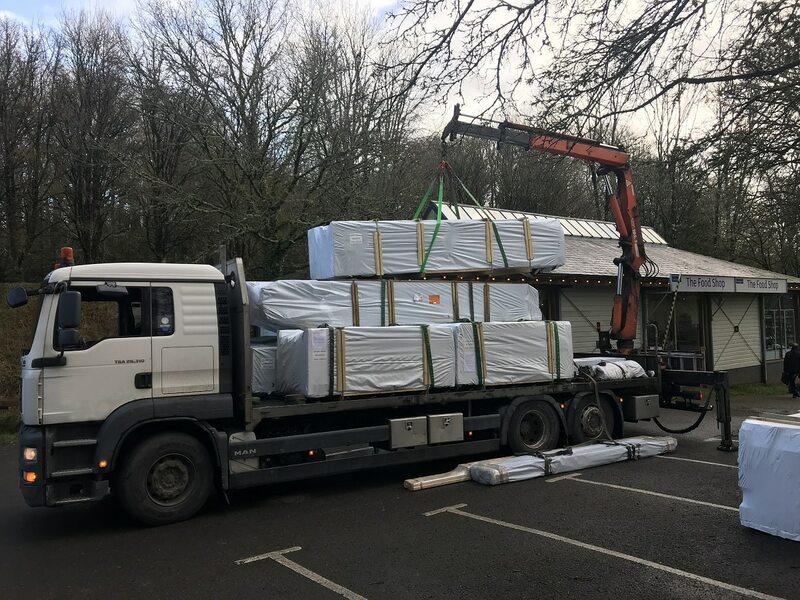 If you feel that there are any restrictions or potential access issues that could occur during delivery, please contact our team and we can advise on the most appropriate solution. 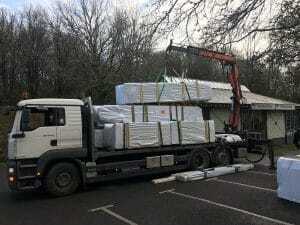 You or your designated representative MUST be on site when the cabin is delivered so you can help with the offloading. 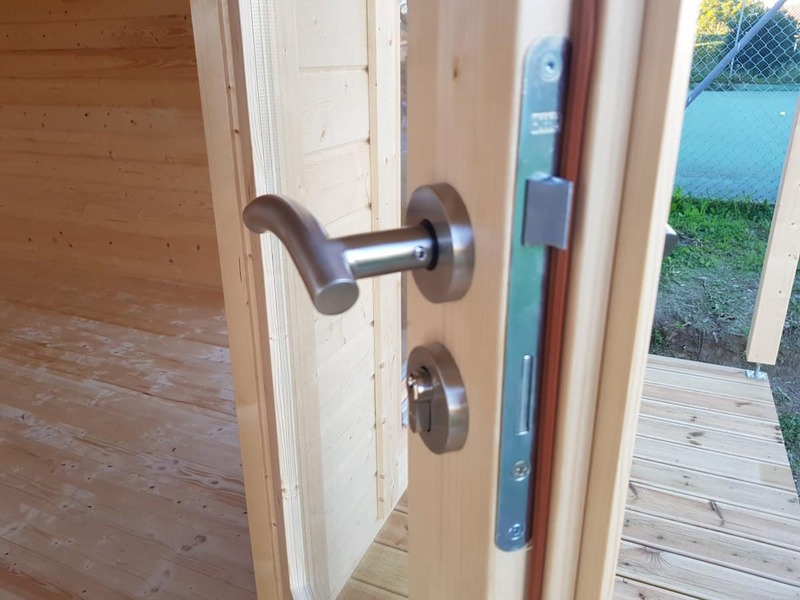 The phone number you place in the contact phone box when ordering your log cabin MUST be one where we can reach you during working hours before and on the day of the delivery. Our staff will contact you within 48 hours once an order has been placed and paid for. They will contact you again approximately five days before delivery, giving you as accurate a delivery schedule as possible. Your log cabin will not simply arrive unless you have been contacted first. Please note that we cannot make delivery of your cabin until it has been paid for in full. Our log cabins come packed in a weatherproof packaging. The parts can stand outside for several weeks before you construct your log cabin if necessary. 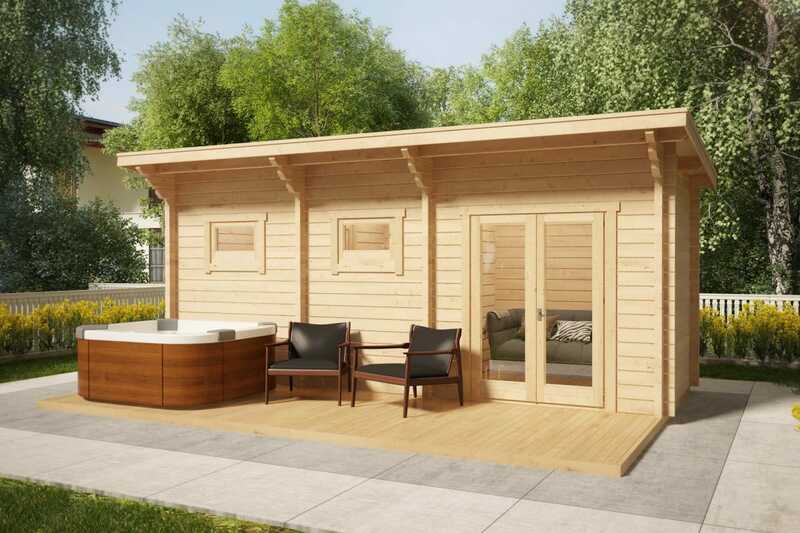 If you are concerned about delivery or any other aspect of your log cabin, please contact us on: 020 3807 0369. 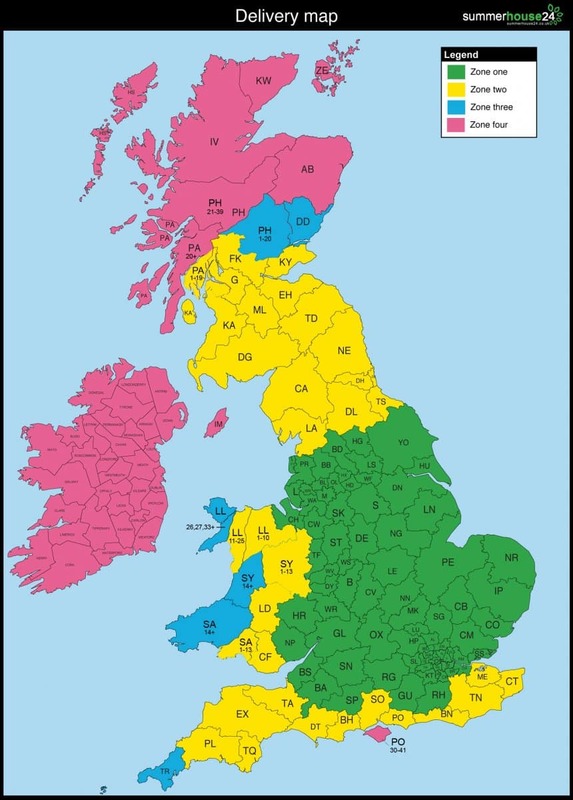 We will usually be able to deliver to the following countries and territories: England, Scotland and Wales. We may from time to time agree to deliver products to other countries and territories. 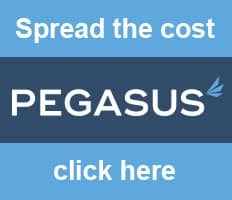 Delivery charges will be calculated by our website and automatically and applied to your order during the checkout process. We are pleased to offer free delivery to a large part of the United Kingdom. More information on which areas qualify for free delivery and additional charges are detailed above. All deliveries must be received in person at the delivery address or by an appointed person, and a signature must be provided. If your products remain undelivered despite our delivery service provider making at least 1 attempt to deliver, we will send you a note with instructions on how you may collect your products, including a time limit for collection. We may agree to arrange for re-delivery of the products, however, we reserve the right to charge you for the actual costs of re-delivery even when the initial delivery was free of charge. An indicative list of the situations where a failure to deliver will be your fault is set out below: a) you provided the wrong address for delivery; b) there is a mistake in the address for delivery that was provided; c) the address for delivery is not reasonably accessible; d) the address for delivery cannot safely be accessed; e) there is no person available at the address to accept delivery and provide a signature.